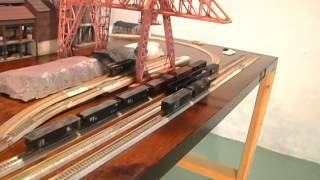 Home Model Trains	Model Railroads, Model Trains: Small Layout, Big Industry. Model Railroads, Model Trains: Small Layout, Big Industry. Starting over in life and with the hobby, AGAIN! Divorce forced me to move and sell off stuff, so here is how I am handling it. Video series to cover utilizing a small space to make a more realistic layout.